Looking gorgeous with clean and smooth skin even after 50 isn’t a myth! 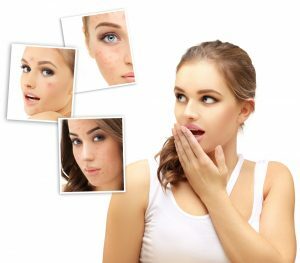 Professional estheticians can make your dream come true with such popular treatments as acidic peels. They help keep face and body in a good toned state, removing visible scars and stretch marks. But how to decide, which one will be the most appropriate, depending on individual skin types and features? The main difference between all chemical peels and manual exfoliation is in the mechanism of its work inside epidermis. Performing it by hands means the appearance of visible breakages and damages on the outer layer. Normally they fade away in few days. One of the chemical peel benefits is its deep penetration inside pores and cells. Such an ability allows to exfoliate and remove cornified dead cells without mechanical damages of the face cover. The acid mixture goes inside epidermis and dissolve undesirable old cells by the work of main chemical elements. Basically, it causes a controlled skin burn, which stimulate the reborn processes, especially production of collagen and elastin. They are basic proteins which provides skin tone and flexibility. Peeling also helps to nourish cells with water and minerals, which is a good prophylaxis of metabolic acidosis. The procedure is dangerous because of the aggressiveness of acids, so you shouldn’t perform deep chemical peels at home. Due to its seriousness, peeling may be done only by skilful cosmetologists or plastic surgeons. At Anna Esthetics we offer several types of this treatment. Of course, it will be more informative to consult and choose the best procedure with professionals. But for now, meet our best offers! Glycolic Acid is an alpha hydroxy acid (AHA) derived from sugar cane that is used in different percentages and pH factors to dissolve the desmosomes between cells to keep skin cells exfoliated. Due to its safety and painless, glycolic peel is one of the most popular type among cosmetologists and their clients. Molecules of acid are very small, so they quickly penetrates the outer layer. This is a kind of easy peel, which influences only the top of epidermis. The mixture with glycolic acid helps to strengthen weak and damaged by age cells and rejuvenate them. This provides the long effect of reduced fine lines and wrinkles on face, neck and decollete zones. Because of the unique structure of glycolic acid it can normalize the in-cells water balance. So, the problem of dry and exhausted skin will be solved. This method is popular due to its painless. Influencing only the corneum layer, it doesn’t penetrate as deeply as medium peelings do. Therefore, clients don’t need any painkillers during the procedure and the rehabilitation period is minimalized too. After the visit skin won’t have redness and irritations for long. It is useful to add some natural herbs acid solutions, which can calm side effects of the main ingredient, for example, green tea extracts. Lactic acid is an AHA acid derived from milk. Lactate is one of the less harmful acids for our face and body. This type of peeling suits people with sensitive skin. One of its benefits is an ability to reduce irritations and calm them. It won’t help with deep wrinkles, because of its tender effect and influence. 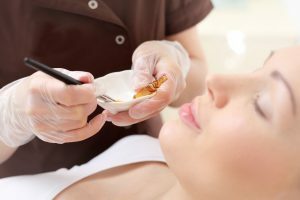 Mixtures for peel contain different lactate levels, so the esthetician will define which one will be the most useful depending on the client’s desires and health state. reduced small mimic wrinkles at their beginning. Trichloroacetic acid is the main ingredient for TCA peel. Mixtures for the procedure have different concentration of acid, so we can perform easy one, medium and deep. It is one of the best chemical peels for acne scars and deep wrinkles. 15% acid mixture helps to exfoliate cornified cells and influences only the outer layer of epidermis. It is allowed to get such treatment no more than two times per one season. The TCA is more aggressive and effective then glycolic one, so it will be optimal to reduce visible signs of aging and skin changes. Trichloroacetic acid is also used to perform deep peelings. but only on the special body areas and in a point method. The procedure has some precautions, so consult with the esthetician first. Jessner solution peel is one of the most popular types among Hollywood actresses and common Americans. It belongs to easy peels, so its depth isn’t too big to harm your derma and cause side effects. In a small amount of time skin gets toned and visibly clean. So, it is the best choice to get a magnificent look without aftermathes or long rehabilitation period in an hour. But not for so long as in the case with other peels, especially medium type. The main ingredients for this “cocktail of youth and beauty” are mixed together three acids: salicylic, lactic and retinoic. They help soothe wide pores, tone skin and make it look prettier and younger. Jessner solution peel doesn’t remove scars are deep wrinkles, but it can reduce hyperpigmentation and frecklesses. It also waters and nourishes skin cells, helping to make the outer layer more elastic and soft. Furthermore this peeling solves problems of oily skin type, removing fat gloss. have oncological illnesses or a tendency to bad wound healing. Some kinds of peelings are appropriate for not bad stages of these problems. So, don’t give up and consult with the specialists first. They will try to choose and offer the best variants including the usage of calming and cooling remedies. 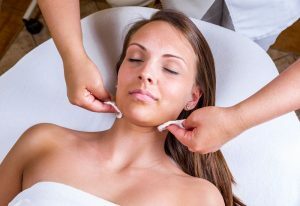 When to Visit Spa for a Peeling and What to Do After? During the hot season our skin is more susceptible to ultraviolet rising, which causes sun damage to our face and body cover. So, for medium and deep peelings it will be more appropriate to choose less sunny and warm weather. We recommend to attend our Tampa beauty spa for this treatment from fall till early spring. Also, don’t forget about chemical peel aftercare – it is very important to keep the result longer and prevent any undesirable side effects. After the visit you shouldn’t sunbathing or applying make-up. Peel client should also avoid additional exfoliation outside of recommended home-care program. Don’t forget to apply oily gels and creams and wash your face using thermal water. Peels do make the skin drier on the surface because the top layer is sloughed off, so keeping the skin hydrated is important. It can take approximately six weeks to notice a difference in the skin, but sometimes improvements are visible after only one peel or one week of using the home-care products. Makeup and straight sun rises are harmful for your sensitive skin with the removed corneum layer. The daily skin care should be more tender and pleasant, so keep an eye on it and stay beautiful!